Today, scientists from the NOAA-funded Gulf of Maine Toxicity (GOMTOX) project issued an outlook for a significant regional bloom of a toxic alga that can cause ‘red tides’ in the spring and summer of this year, potentially threatening the New England shellfish industry. An abundant seed population in bottom sediments has set the stage for a significant bloom of the toxic alga Alexandrium fundyense. This organism swims in the water, and divides again and again to form a “bloom” or red tide, but it also produces dormant cells or cysts that fall to the ocean bottom at the end of these blooms. A cyst survey conducted in late 2009 shows the highest amount of cysts the team has ever measured, more than 60 percent higher than what was observed prior to the historic red tide of 2005. The cyst bed also appears to have expanded to the south, and thus the 2010 bloom may affect areas such as Massachusetts Bay and Georges Bank sooner than has been the case in past years. This year’s bloom could be similar to the major red tides of 2005 and 2008, according to Woods Hole Oceanographic Institution (WHOI) biologist Don Anderson, principal investigator of the GOMTOX study. The 2005 bloom shut down shellfish beds from Maine to Martha’s Vineyard (Mass.) for several months and caused an estimated $20 million in losses to the Massachusetts shellfish industry alone. The 2008 outbreak was similar in scale. Although the algae in the water pose no direct threat to human beings, the toxins they produce can accumulate in filter-feeding organisms such as mussels and clams— which can cause paralytic shellfish poisoning (PSP) in humans who consume them. In order to protect public health, shellfish beds are closed when toxicities rise above a quarantine level—often during the peak harvesting season. Due to effective monitoring by state agencies, there have been no illnesses from legally harvested shellfish in recent years—despite some severe blooms during that time period. There have been, however, several severe poisonings of individuals who ignored closure signs. WHOI oceanographers Dennis McGillicuddy and Anderson, and North Carolina State University (NCSU) Prof. Ruoying He are several years along in the development of a computer model to predict the intensity and location of blooms of the toxic algae Alexandrium fundyense in the Gulf of Maine. The model is initiated from the cyst abundance maps, and simulates Alexandrium germination, growth and dispersal using each year’s winds, sunlight, rainfall, tides, and currents. Scientists are reluctant to make a “forecast” of precisely where and when the regional bloom will make landfall because bloom transport depends on weather events that cannot be predicted months in advance. Coastal exposure to the blooms is worst for scenarios in which the spring and summer weather is dominated by strong northeast winds, which tend to drive Alexandrium cells toward the New England coast. 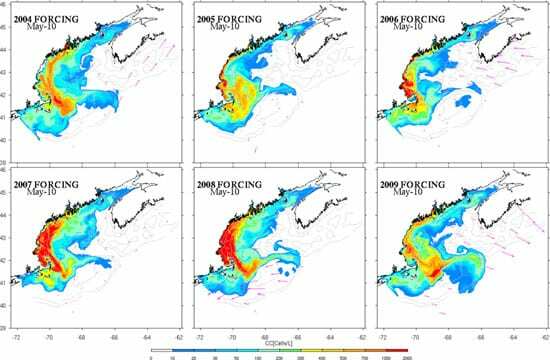 That occurred last year (2009), when an unusual series of northeast winds in late June and early July led to closure of almost the entire Maine coast to shellfishing. In contrast, when southwesterlies dominate, the algae tend to stay offshore. GOMTOX researchers regularly share their field observations and models with more than 80 coastal resource and fisheries managers in six states as well as federal entities like NOAA, the Environmental Protection Agency, and the Food and Drug Administration. Managers believe that a regional-scale, seasonal outlook can be useful in preparing for contingencies. This advanced warning, along with updates closer to and during the red tide season, can help state agencies prepare for monitoring red tides and assessing public health risks, and also give shellfish farmers and fishermen the opportunity to shift the timing of their harvest or postpone plans for seeding of aquaculture beds. Area restaurants may also benefit from advance warnings by making contingency plans for seafood supplies during the summer. Ruoying He, representing scientists from the GOMTOX project, will present data and models on the projected bloom at the 2010 Ocean Sciences Meeting today in Portland, Ore. 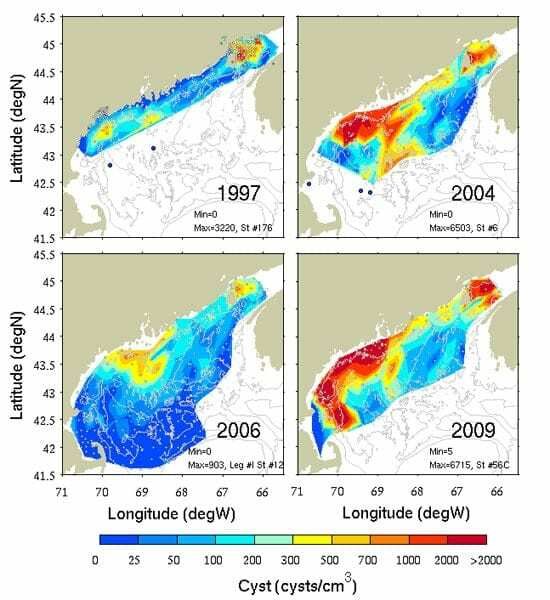 The GOMTOX project, funded by NOAA’s ECOHAB Program, is a collaboration of investigators from NOAA, WHOI, NCSU, University of Maine, University of Massachusetts Dartmouth, Rutgers University, the Food and Drug Administration, the Canadian Department of Fisheries and Oceans, Maine Department of Marine Resources, New Hampshire Department of Environmental Services, Massachusetts Division of Marine Fisheries, and the North Atlantic Clam Association. Other support for Alexandrium studies in the Gulf of Maine is provided by the National Institutes of Health and the National Science Foundation through the Woods Hole Center for Oceans and Human Health. Maps of the Gulf of Maine reveal the concentration of Alexandrium cysts buried in seafloor sediments, as detected by WHOI-led surveys in the fall of 1997, 2004, 2005, 2006, 2007, 2008 and 2009. Four of those surveys are shown. The cyst abundance in 2009 is higher than ever observed in these past surveys. Note also that the Alexandrium cyst “seedbed” extends further to the south than was ever observed before.